Background: The IC Analyst-Private Sector Partnership Program, sponsored by the Department of Homeland Security’s Office of Intelligence and Analysis, on behalf of the Director of National Intelligence, facilitates collaborative partnerships between members of the private sector and teams of experienced Intelligence Community (IC) analysts. The areas of focus selected for this year’s program, based on intelligence priorities, were: Energy Security, Money Laundering, Identifying and Countering Insider Threats, Air Domain Awareness, Identity Theft and Illicit Activity, Game Changing Biotechnology. Our group, based on individuals experience and expertise, was selected to work on the Insider Threat topic. Deliverable: Our group set out to develop a resource that provides the essential elements required to initiate an insider threat program. To accomplish this, our group relied on several sources including: personal experience in the public and private sectors, interview with industry experts, overviews of insider threat programs and countless discussions among team members. The 13 essential elements were developed to follow a timeline from the first step (initial Planning) to the last (Feedback/Lessons Learned). In practice the processes required are iterative and will require coordination and communication throughout. 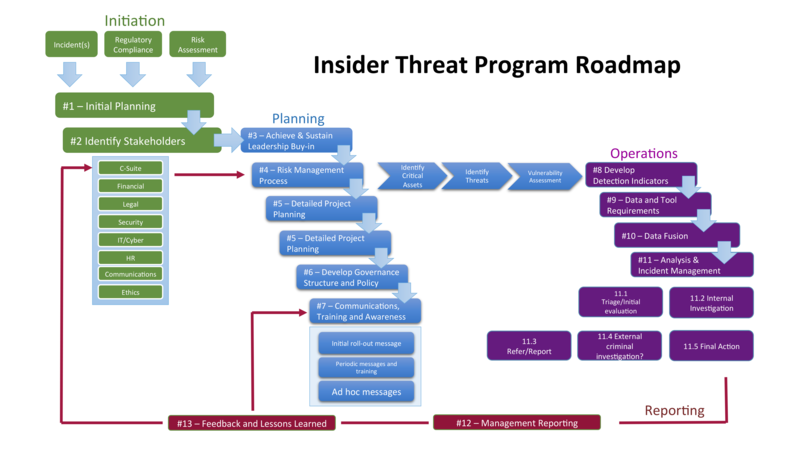 In addition, we reviewed more than 200 insider threat publications, and mapped them to the 13 Essential Elements. The degree of relevance to each element is also indicated in the spreadsheet. We believe that this spreadsheet will serve as a useful resource for any organization that is creating or maturing an insider threat program.